Printix Cloud Print Management Service is a cloud-based multi-tenant subscription service, which runs with Printix Client installed on users’ computers (Windows and Mac) and with a copy of the print infrastructure. No on-premise servers and databases are required. You have access to an administrative account. You can sign in to the print servers on the network. 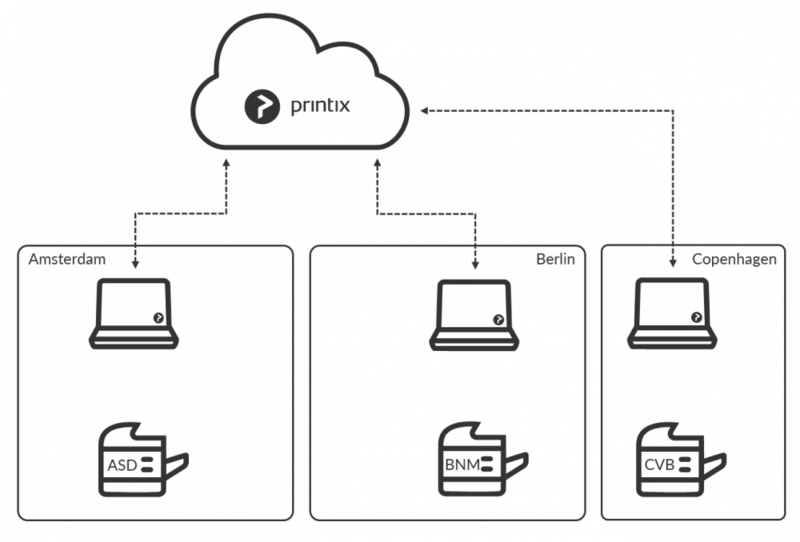 Create a new Printix Home. 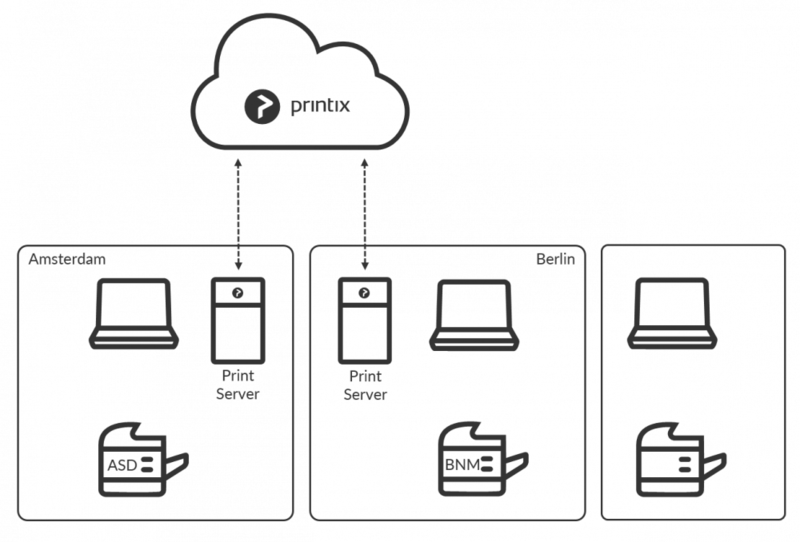 Install Printix Client on the print server. *Printing via the shared print queues on the print server continues to work and no restart is required. 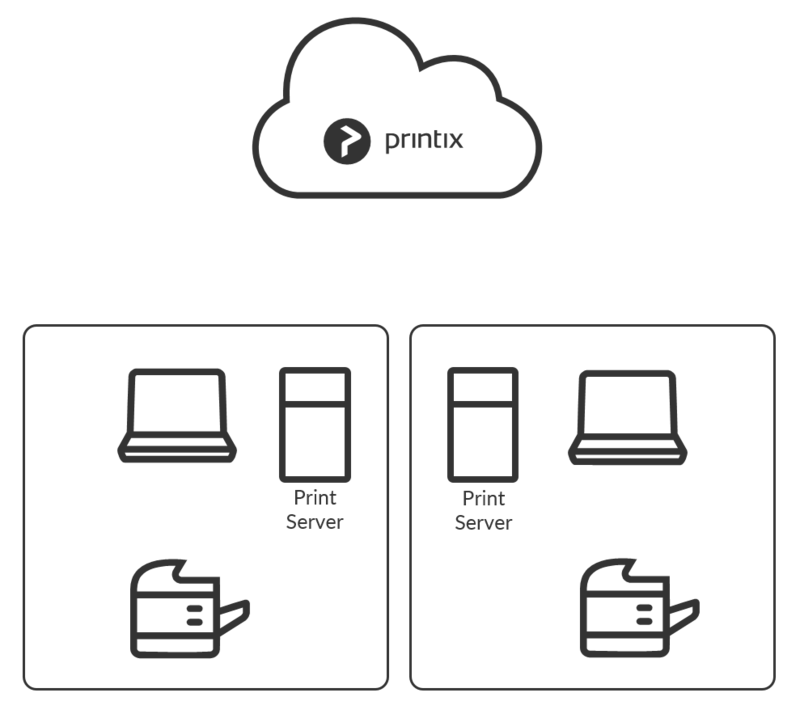 Printix never converts print queues on Windows Servers. Printers are discovered and registered in the Printix Cloud. 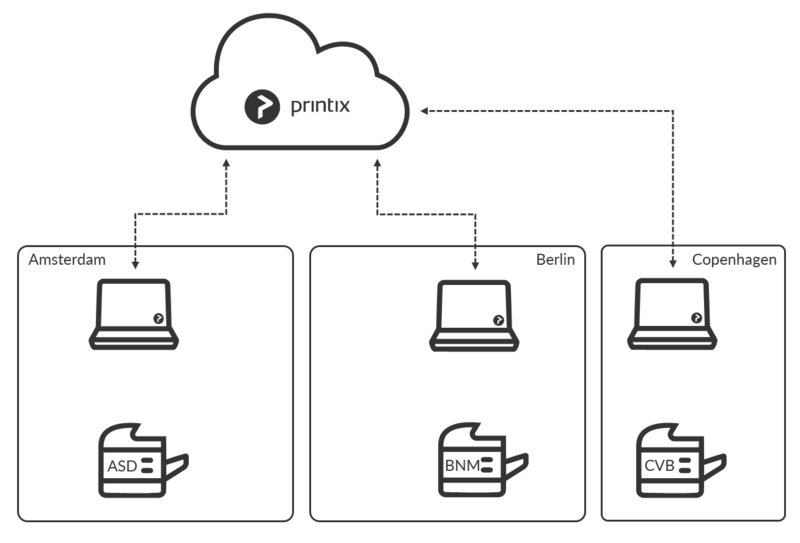 Print queues are discovered and registered in the Printix Cloud. Print drivers are registered for each print queue on the print server. Signed and unique print drivers are uploaded to your Printix driver store. Printers get a three-letter printer ID (ASD, BNM, …). Printers that are not online at this time can be added later. Network1 is created with the gateway of the print server’s network adapter. If printers were found via for example two network adapters (LAN and Wi-Fi), then an additional Network2 is created with the gateway of the other network adapter. If the networks are logically the same, that is computers on Network1 can connect to computers on Network2, and vice versa, then you should merge the networks. Optionally Modify the network name Network1 to a descriptive name (Amsterdam). If there are additional print servers on this site, then install on these also, to make the copy of the print infrastructure as complete as possible. Open the Computer properties page of the print server and select Discover printers. If printers were found via for example two network adapters (LAN and Wi-Fi), then an additional NetworkN+1 is created with the gateway of the other network adapter. Optionally Modify the network name to a descriptive name (Berlin). Install Printix Client on a computer at the site you want to add. If you can remotely sign in to the computer as administrator, then you can also install Printix Client. Sign in to Printix Client. The user’s computer appears on the Computers page as being on an Unknown network. If the computer has for example two active network adapters (LAN and Wi-Fi), you will see Unknown Unknown, one for each network adapter. Use Add network and give the network a descriptive name (Copenhagen). Use Add to network to add the gateway (LAN and/or Wi-Fi) of the computer to the network. Use Discover printers and select the newly added network (Copenhagen). The user’s computer appears on the Computers page as being on the network: Copenhagen. Each print queue on the computer that points to a registered printer is converted. If there are additional sites, then install on these also, to make the copy of the print infrastructure. Use your preferred method to deploy Printix Client, such as Microsoft Intune, and get users to print with Printix. If users Sign in with Microsoft you may want to Accept Printix for all users. Verify that the print servers’ shared print queues can be paused without users complaining. Verify the server does not have additional roles, such as Domain Controller, File Server, etc. Save on infrastructure and support costs. Eliminate WAN traffic related to print jobs. Track user and usage statistics. Flexible and secure printing (Print anywhere and Print later). Unlimited scaling at no extra cost. Printix software automatically update itself to the latest approved version. Deploy and control access to printers based on users’ group membership.